Want a fast-growing, ever-changing, endless supply of willing customers to target with your marketing efforts? If so, don’t overlook the lucrative new movers segment. According to the U.S. Postal Service, over 43 million address changes are processed each year. These movers (people who have moved) and pre-movers (people in the process of moving) are eager to spend money and build new relationships with retail and service businesses in their area, including grocery stores, banks, health clubs, restaurants, auto shops, and more. It’s a highly motivated, receptive audience that represents a tremendous marketing opportunity—if you know how to reach them. MoverTrends.com reports that on average, new movers spend more in the first six months after a move than a typical consumer does in three years—totaling nearly $170 billion each year. And not only do they spend more, they also tend to be more loyal. Their interest in getting settled and establishing new relationships means new movers generally stick around when they find businesses they like. Which is why they are five times more likely to become long-term customers compared to the average customer. A high-quality list. Having an up-to-date, high-quality prospect list is probably the number one key to success. If you’re not armed with correct address data, you won’t reach the right people. Your list should be compiled from several sources and updated often. Since people are constantly moving and changing addresses, it’s important to use the most current information available. Frequent timing. Because of the shifting nature of the audience, it’s important to keep your marketing efforts going constantly, all year round. And since people often need a few communications before they decide to act, you should stay in front of them regularly—especially during the early months when movers are establishing relationships with businesses that may last many years. If you don’t stay top of mind with new movers, somebody else will. Attention-getting creative. New movers receive a fair amount of marketing pieces from neighborhood businesses. To reach them effectively, you need to stand out from the pack. This is the time to be creative, try something new, and ensure your marketing investment will get noticed. A friendly approach. New movers are an excited group. They’re happy to be in their new home and eager to learn about their new neighborhood. Don’t be too formal with them. A comfortable, friendly tone will go a long way toward breaking barriers and building relationships. A solid plan. For maximum effectiveness, any marketing effort requires a carefully considered plan. Don’t just run a smattering of random ads in local publications or send out a few postcards. Figure out what you’re doing and why. Have a strategy for how and when you’ll approach your target audience. Put systems in place for tracking your marketing efforts so you know what’s working and what isn’t. A solid plan will greatly increase your odds of success, while keeping you organized and on track. Creating loyal, active customers from a constantly changing supply of new movers can make a big difference to your bottom line, making this a key audience for growing your business—and a perfect one to target with your marketing efforts. The potential rewards are well worth the investment. To find out more about how to effectively reach new movers, or for help in putting together a successful program of your own, contact Maureen at mdyvig@dtrio.com or 612-436-0321. Recycling. It’s not only good for the environment. It’s good for marketing, too. From music, to movies, to fashion, our culture has always had a soft spot for the past. And now more than ever, the marketing industry seems to be taking notice. But it’s more than the trend toward retro-cool. After all, the fashion industry has brought back styles from the past as long as there’s been a fashion industry. No, nostalgia marketing is something different. Always striving to create a deep, positive connection between their brand and consumers, marketers are realizing the emotional pull inherent in the sights, sounds, and tastes of the past. Nostalgia is a powerful emotion. It instills warmth, comfort, and feel-good memories. It’s been known to increase mood, self-esteem, reduce stress, and create positive feelings about the future. To that end, all kinds of old items are enjoying a resurgence. High-end restaurants are serving comfort food with a twist. Pro sports teams play to full stadiums on throwback uniform days. After years of declining watch sales, people are going gaga over the Apple watch. Vinyl records are popular again (hopefully 8-tracks are still far behind). So are old toys (especially among full-grown adults), classic kids’ books, retro candy, and revitalized brands like Surge, Crystal Pepsi, and Shinola. Basically, if it’s old, it’s cool again. Why the trend toward nostalgia now? A big factor is the digital age we live in. Technology can be impersonal. Our interactions with people and the world are often filtered through our screens. We feel alone, alienated, and disconnected much of the time. We long for connection more than ever. Nostalgia is a great way to make that connection. By bringing back positive memories of the past, we’re instantly connected to a comfortable, simpler time—as well as to each other. Nostalgia allows us to share common experiences, and create new ones. While people’s lives are busier and more stressed out than ever—juggling work, family, bills, and dozens of other things—taking a quick trip to Nostalgia Land is like a mini vacation. It provides comfort, fun, and a little respite from our everyday lives. By placing their brand within this context, companies encourage consumers to associate their products and services with happy times and positive feelings. It’s an approach that’s highly effective across all generations, including the elusive Millennials. While it may appear to be somewhat of a trend, nostalgia marketing is definitely no flash in the pan. It’s been used before and will keep being used, especially as consumers continue to feel more disconnected while searching for authentic experiences that bind them together. An emotional connection with consumers is something every marketer aspires to achieve. As you consider your own marketing efforts, don’t overlook the power of nostalgia to create good feelings between you and your customers. Is there some way you can leverage the past, either through your own brand’s history, or by borrowing from popular culture, music, old movies, or something else? As we all race faster toward the future these days, nostalgia marketing teaches us that sometimes the best way to succeed tomorrow is to keep an eye on the past. The series finale of Mad Men seems like old news having aired over a month ago, but before writing this I had to wait for a bunch of people to catch up. If you’ve not yet watched … you might want to stop reading now. For the rest of us, are we still wondering who wrote the ad? Probably not. Regardless of the side you are on, what surprised me most as I spoke with friends about the last episode was it seemed people either completely thought Don wrote the Coke ad or they were absolutely certain it was Peggy. And, in most cases, they had not even considered the alternative. Creating both this duality and certainty is a final tribute to the show’s writers. However, what I most loved about the finale was not about who wrote the ad. What I loved was how the episode captured the way in which our lives and our experiences influence our creative process. We don’t have to escape to a yoga retreat to be inspired. We can gain inspiration from a rock, a color, a joke, they way light reflects off an object, or an interesting comment that leads us in an unexpected direction. We get inspiration simply from paying attention. 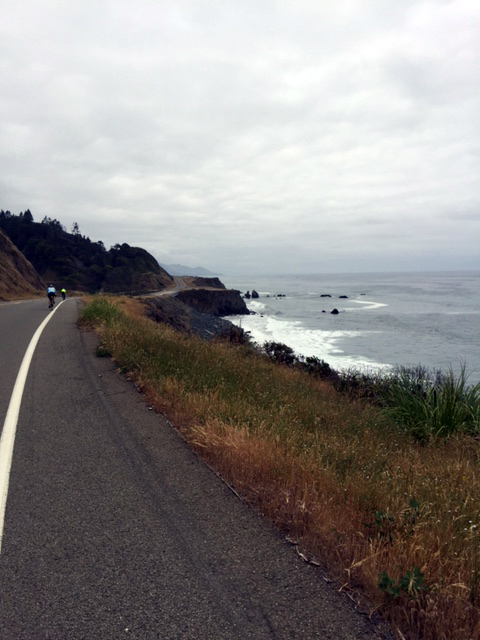 Did Don’s experience meditating on the mountain top provide his inspiration to write the ad, or did Peggy, talking to Don and imaging his experience on the mountain top inspire her. We’ll never know for sure. Agency News: Welcome to the world Finn! 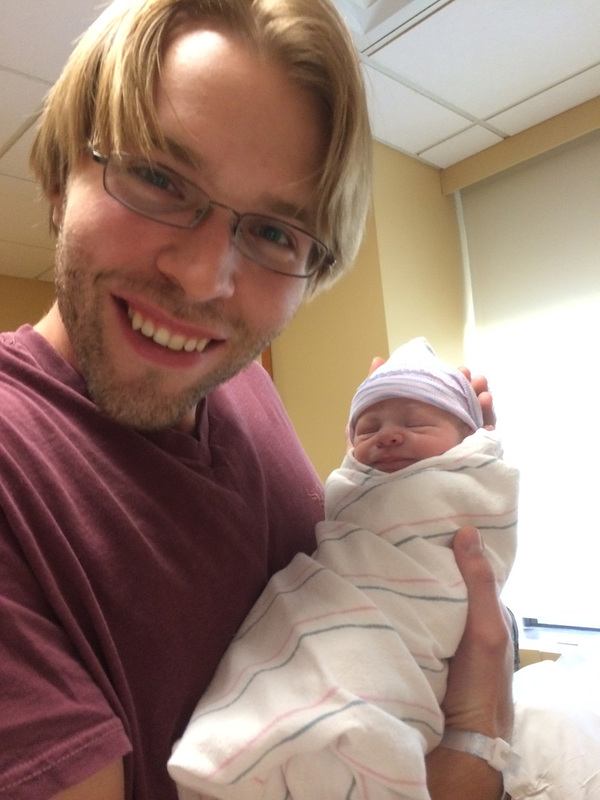 We are excited to announce the arrival of Finnian Timothy Swenson. Finn was born on June 9, 2015 and weighed in at 5 lbs, 4 oz and was 18.25” long. As a first time parent, we asked Tim what surprised him most about about having a new baby. He said, “I didn’t know how many diapers a newborn could burn through until now. It’s impressive.” And what does Tim most look forward to as a father? Taking Finn to a Minnesota Wild hockey game, of course. Congratulations to Tim and Terri! Trending Now: The millennial “yuppie” has arrived. According to the Internet, the hipster and his overly grown-out beard is dead. Introducing the newest term Millenials have given birth to; the Yuccie. One part old- fashioned yuppie (think Christian Bale’s character in American Psycho) and one part hipster. Most importantly, the Yuccie identifies as a creative. Case in point, the term Yuccie is actually short for Young Urban Creative. In an article written by David Infante posted on Mashable.com, he explained that a Yuccie acts as a cross between “the yuppie’s new money thirst for yachts and recognition, and smoke-laced individualism. Then sprinkle on a dose of Millennial entitlement.” Sounds annoying. According to recent articles on the subject, Yuccies seek jobs where they can both earn a decent living and be fulfilled by their tasks. In short, the modern day yuppie (we are calling Yuccies) seek creatively influenced jobs that stimulate their minds as well as passions – BUT the jobs must also pay for their expensive iPhones and electric cars while providing some extra cash to spend sipping microbrews and craft cocktails on the weekend. Wait… This is starting to sound familiar to us. 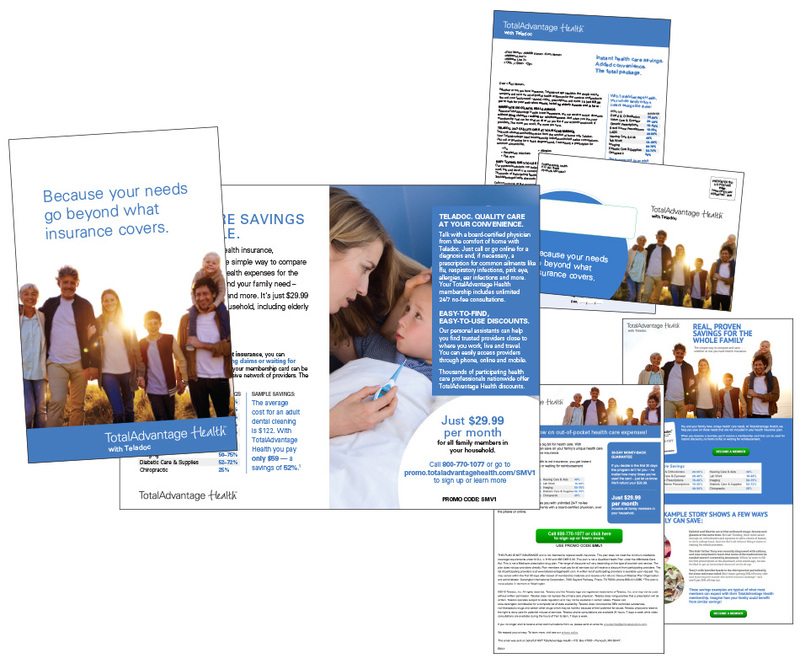 AmTrust Solutions wanted to test direct-to-consumer marketing for their discount health services product, TotalAdvantage Health. In the past, it had only been promoted through third parties. Since the product is somewhat complex and new to their target audience, we decided direct marketing was the best way to spread the word. So we helped them put together a mail plan, worked with their list provider to determine the best prospects, and designed and developed messaging for both a self-mailer and letter package (for the purpose of testing formats). We also created a follow-up promotional email and a landing page to encourage recipients to learn more about the product and sign up online. We’re still analyzing the final results, but we’ve already learned a lot. Take a look at the campaign we designed. Want to improve your marketing copy? Try these tips. Know your audience. You wouldn’t talk to a group of bikers at Sturgis the way you would a room full of retired librarians. Same goes for your writing. Make sure your message is appropriate to the audience. Consider the context. Keep it simple—and concise. Get to the point. Get in, get out, tell your reader what she needs to know, and don’t go on and on about it. Please don’t overcomplicate the message with superfluous information. Just give the reader the minimum amount of information she needs. She’ll thank you for it—by reading your words instead of skipping past them. Know thy message. You can’t communicate well if you don’t know what you’re communicating. What’s the point you’re trying to make? If that point isn’t crystal clear, your writing will be all over the place. Good marketing copy requires a clear message. Always. Be likeable. Marketing copy, like all writing, is all about connecting with your reader. You’ve got to say something that makes somebody care—and respond. How do you do that? The same way you connect with anyone. You talk about things that interest them. You charm their pants off. Say something clever, witty, funny. Approach your writing the way you approach your friendships and it will be a whole lot better. Find the sweet spot. There are two camps. One says you should focus your message on benefits to the reader. Prove what’s in it for them and why they should give a hoot. The other side says you should just talk about who you are and what you have to offer. Don’t tell the reader what to think. Let her discover for herself that place where her needs and your offerings meet. Either approach comes down to the same thing—be relevant. Provide something of value. Find the sweet spot between who you are and what your reader needs and build your case on it. Less is more. The less you try to say, the greater its impact. Marketing copy is not a Hefty bag. It’s not about how much you can cram into it without it breaking. Actually, the opposite is true. The fewer the messages you put into your copy, the greater the impact of each one. Otherwise, you’re watering it down. If you really want to make your copy memorable, give it a singular message. It’s a one-sided conversation. The problem with a lot of writing is that it’s sooooo stinking dull. If people would just write the way they spoke, we’d all be a whole lot better off. So take a deep breath, ditch the formalities, and act like you’re sitting next to somebody and talking to them. Because really, when you come right down to it, you are. Typography is a core feature of all information design, from small space ads to annual reports, even of internal memos and emails. Good typography raises the level of presentation, makes information more readable, ideas easier to follow and gives layouts flow and a sense of space. Good typography makes your messages clear and tells the reader something about the professionalism of you and your company, the kind of products you sell, and can guide them to take the action you want them to take. Bad or careless typography can make your company seem small or unprofessional, can make your product feel cheap, or can make your ideas hard to follow. You can spend all the time in the world crafting your message, and if you present it in a way that is hard to follow or badly organized, your audience will miss out on what you’re trying to tell them. Most people don’t see the details of typography until the details are absent. They may not notice that a particular typeface has extremely thin strokes until they see it printed quite small and realize it looks broken. They may not recognize the importance of type hierarchy until they can’t tell which paragraphs in a long document relate to each other. How can you tell the difference between good typography and bad typography? The basics are pretty easy and you likely do it unconsciously already. If you’ve ever thought to yourself “this page looks too busy, there’s too much copy”, that was likely your brain telling you that the copy didn’t have the proper leading (space between lines) or wasn’t organized with a consistent type hierarchy. If you’ve felt that a company was too small or unprofessional to give your credit card to based solely on how an ad looked, it may have had a lot to do with their using six different type styles and that everything on the page was bolded. Use a maximum of two typefaces. Use different weights (thin, bold, black) of the same typeface if you need to break up information. Be consistent. If one subhead is bold, all subheads of that same level should be bold. All fonts have a personality, use one that is appropriate for your content and brand. You wouldn’t use the same type style on a six year old’s birthday invitation as you would on your wedding invitation or a business event invitation. If you’re using multiple typefaces (remember, only 2), don’t use two that are very similar. For example, consider using a serif for the headline and a sans serif for body copy. Don’t use Comic Sans for anything other than a six year old’s birthday invitation. For a good explanation of why, click here. These typography basics should keep you from being the target of your company typography snob. 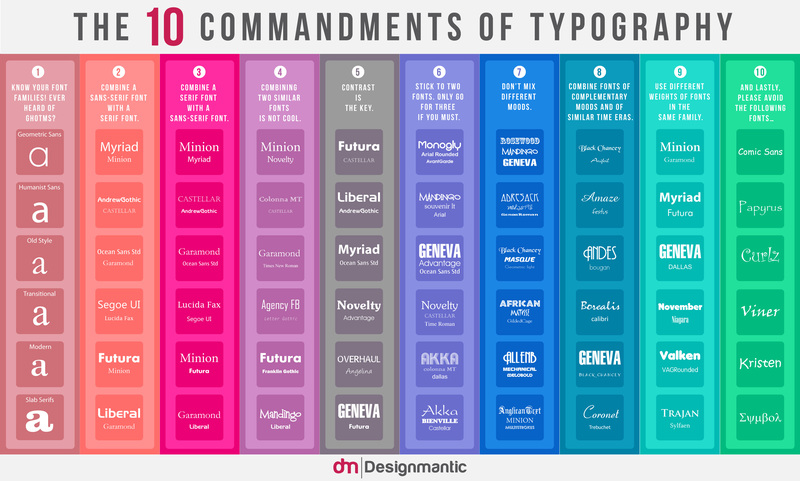 For more typography rules see Designmantic’s infographic on the 10 Commandments of Typography below. Snap Chat. Not just for hormone crazy teens anymore. By now we assume most people know what Snapchat is, but for those of you still in the dark, Snapchat is a mobile application that lets users take photos or videos and send them to other users you are connected with. The difference between Snapchat and other photo messaging apps is that your “snap” is only viewed by the other user for 10 seconds or less after which the snap is deleted forever. Many assume Snapchat’s biggest draw is the temporary nature of the snaps, potentially encouraging racy images without having to worry about the repercussions. But recent stats have shown otherwise which has marketers intrigued. Interesting data right? So how are some marketers using the app? Product advertisers have used the app to launch a 10 second sneak peek to their followers, giving a product launch some additional hype. Retail marketers have turned to sending out custom coupons to their customers. This approach brings consumers into the store or directs them to an ecommerce site, gets them shopping around, and reveals the coupon later creating a sense of anticipation. Ultimately, though, the app is all about increasing engagement. Most recently, d.trio was onsite at a photo shoot for our University of Minnesota client. The shoot was on campus and involved current students as the subjects. During each set I kept catching the students snapping “snaps” of the shoot and was curious where they were sending them. To my surprise it wasn’t to their friends, but to the U of M Snapchat handle called “My Campus Story.” When I asked how it worked the students informed me that “everyone follows My Campus Story” and tries to get their snaps featured daily. Only snaps featuring the students doing something cool on campus or at U of M events are featured. The U of M has increased student engagement on campus by selecting student snaps to feature on its own handle. Students now send snaps regularly in an attempt to be featured. Pretty cool way to create some brand engagement if you ask us!